You can’t go to Venice without noticing the abundance of mask shops. A lot are touristy and feature knockoffs from China, several shops do elegant work. But regardless, the mask is an intriguing part of the Venice experience and a tradition that goes back centuries. In fact one of Venice’s not-so-favorite sons, Casanova, is known to have used masks in his seductions. Masks are part of the Carnevale tradition, celebrated in the spring. 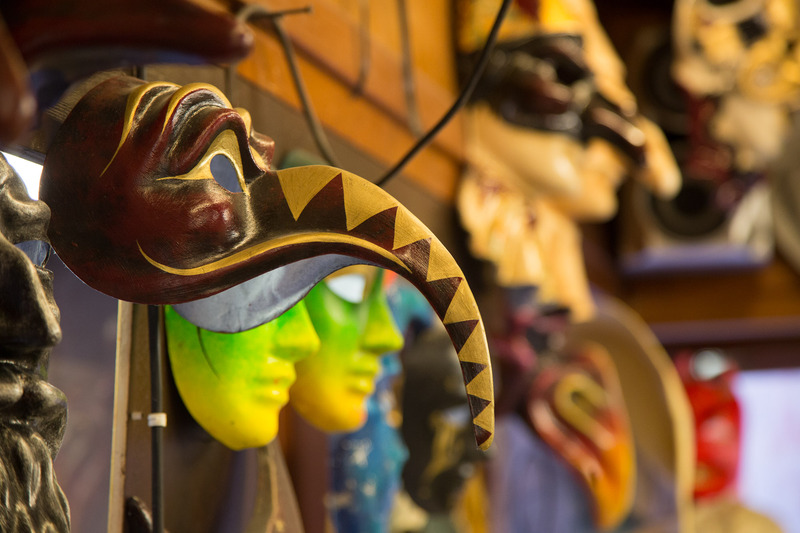 Masks were also part of the Commedia del Arte theatre tradition practiced by the Venetian writer/director, Goldoni. 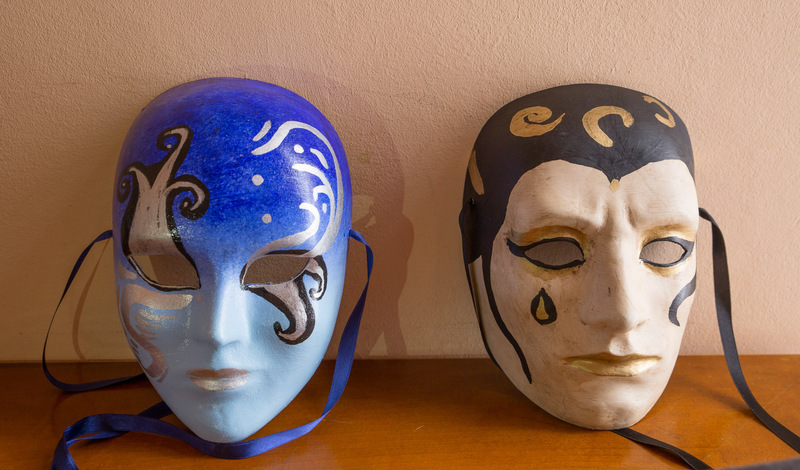 In all these traditions, the mask is a representation of identity, personality. It’s a false identity in Carnevale, one that evokes mystery. 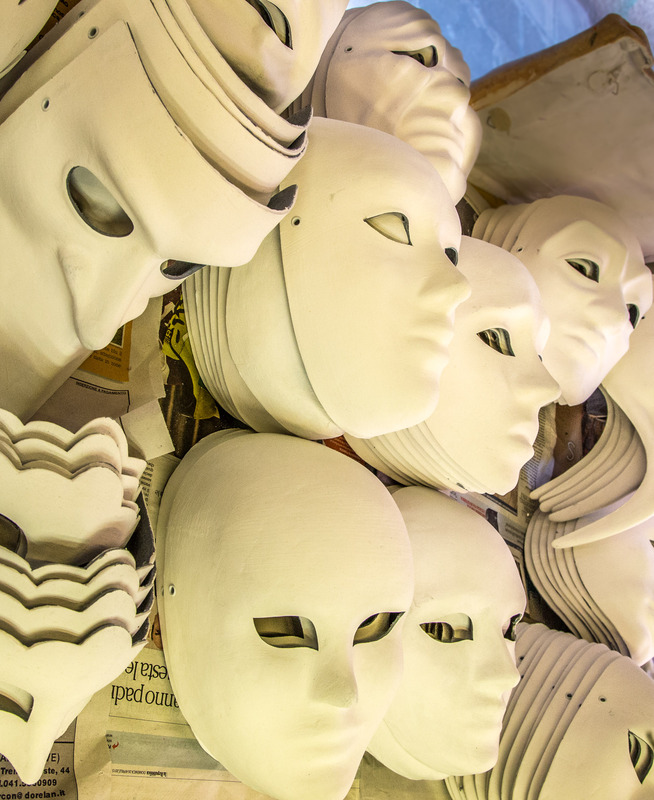 And in theatre, the mask becomes a trigger to the character’s personality. The actor puts on the Doctor or Harlequin mask and takes on the character and physicality embodied in that mask. The best way to appreciate the power of masks is to take a class. 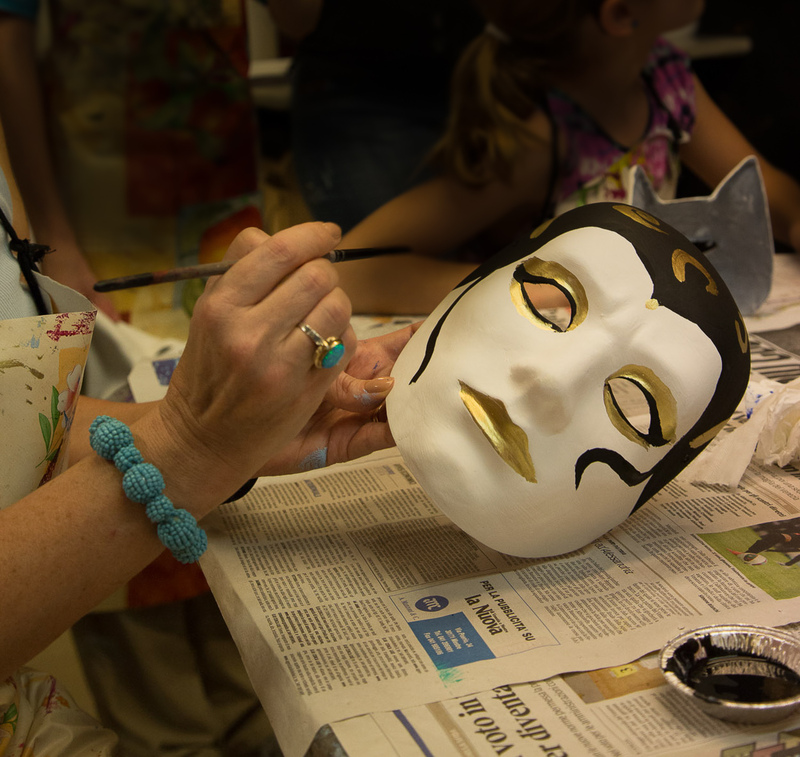 Mask making workshops are most popular with families, especially with kids in the 7-14 age range. And often the parents support the kid from the sideline rather than get in there and risk looking like an idiot. That’s too bad because this kind of workshop can be an intriguing experience for couples. Adults know more than a little about the social masks we all wear and some of that aspect of personality emerges while creating one. 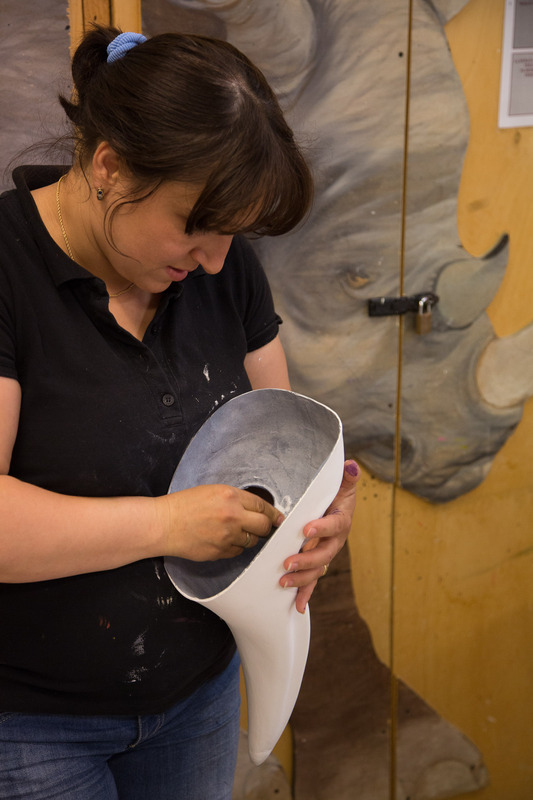 Marina and I decided to work with Ca’ Macana, one of the most respected mask making companies in Venice. The company made several of the masks used in the Kubrick film, Eyes Wide Shut, and the masks become a powerful metaphor for illusion and personality. We went to the Ca’ Macana workshop location, just a couple of blocks from one of their main stores in the Dorsodoro section of town. 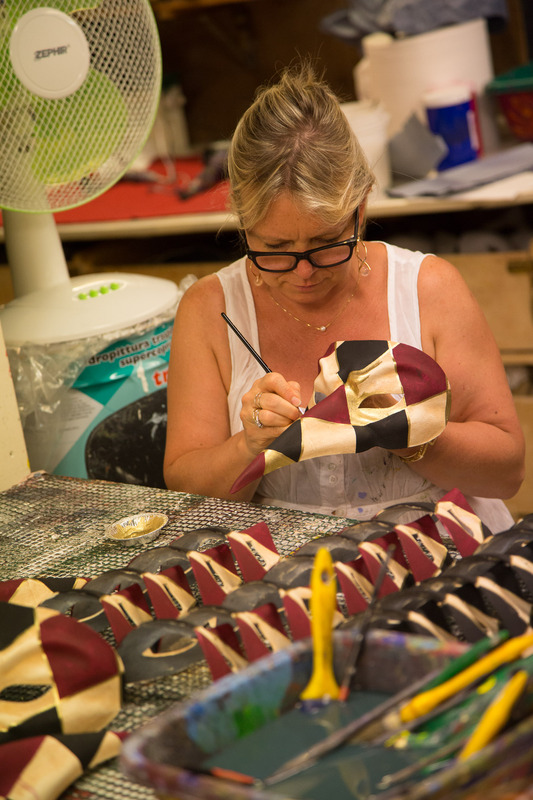 This is also where their factory is so you get to see them working on their standard masks as you do your own thing. They start off by giving you a choice of blank mask form. They have a pile of white paper mache masks: Commedia del Arte character masks, animals, and what the theatre world would call “neutral masks,” those with a blank persona. I’ve always had a fascination with the neutral mask because it allows the actor to show more of a range of characters than the more exaggerated choices. So that’s what I chose. Marina chose a female neutral mask. Then they have you choose two (generally) base colors. They have some visual guides to help with this selection. Marina chose a deep/light blue combo. I wanted to stay with my more neutral approach so I went with a cream colored mask base and then used black and gold for my accent colors. You lay down your base colors first and if, like Marina, you are doing a two-tone, they show you how to stipple and blend the two color choices. I started looking at their choices of design elements, masks with diamonds, tear drops, delicate filigree work, they have everything. I started off thinking I would have some cool curves in the top of the mask that would migrate to the other side of the face about half way down. After about 5 minutes tracing out the shape I realized that my drawing ability hasn’t grown past the stick figure level and no amount of design and photo work has changed that. I simply cannot sustain a steady brush stroke. So I radically simplified my design. I had laid down a black forehead shape that looked vaguely like a widows peak hairline. That wasn’t too hard to make work. Then I remembered the Vision character from the latest Marvel Avengers movie. So I extended the black down towards the bridge of the nose like the Vision. That part shouldn’t be hard but I almost lost control a couple of times. I saw that the designs all had some coloring around the eyes and lips and figured that wasn’t too hard, hey, the mask form gives you those facial shapes already. Again, it looked a bit like a disaster but I pulled it together. There was still something missing. And my drafting chops were no match for the spirals and shapes that seem so cool and so easy on the sample drawing they give you. Our instructors weren’t going to clean up my work. They want you to do it all. Luckily my wife has done makeup work at Macys and she realized early on that painting a mask is really just a step away from putting on makeup. She had no trouble at all with doing all the advance stuff. So she took pity on me and added some dark mysterioso lines and a teardrop to what I had already. I know it’s cheating, but I didn’t care. And after her touch up, my mask looked like it was all done on purpose. 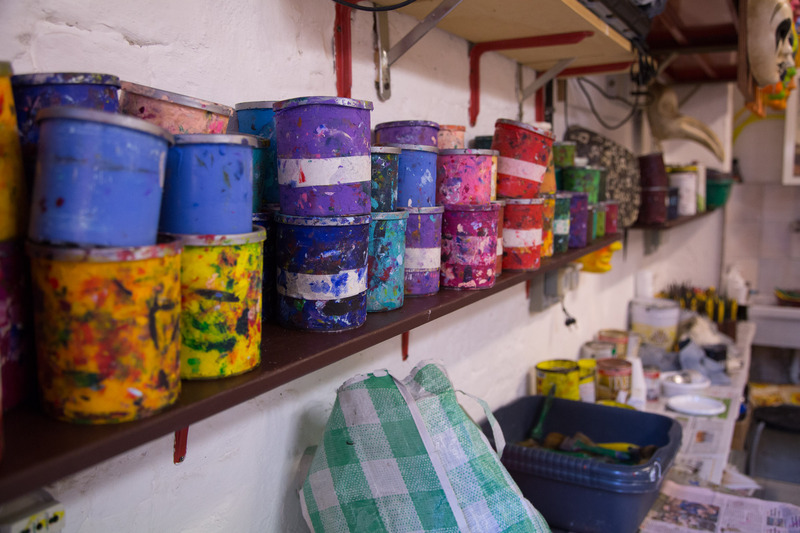 Then we used an industrial blow dryer to set the colors. 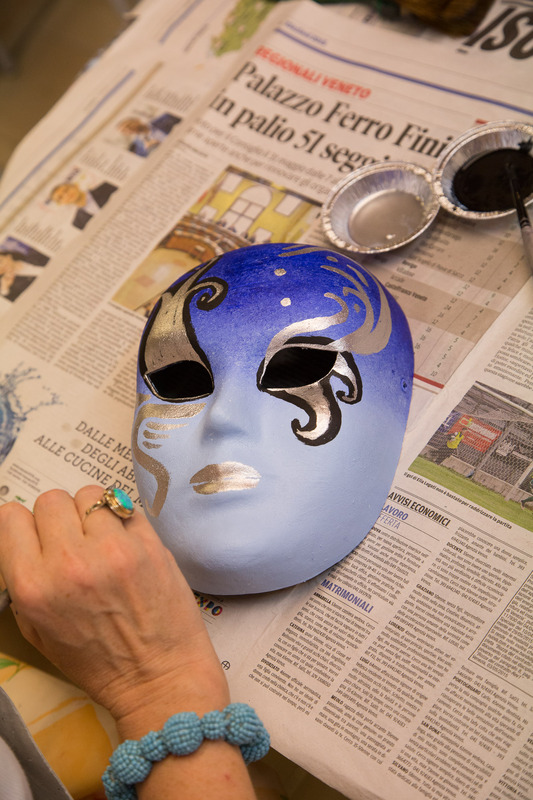 Once the colors were fast, they give you some brownish varnish to spread on the mask. It’s a bit like laying on shoe polish and then buffing it off. But it gives the mask a finished look and keeps the paper mache from getting damaged. Then you get a ribbon for each side of the mask for wearing it or hanging on your wall. And you’re done. Ta Da. I remembered the instructions I got when I worked with masks in an acting class in grad school. Before you put the mask on, you’re supposed to study it, take its features in. Then you put the mask on with the realization that this façade is shaping how your audience sees you. So the more you explore with the mask on, the more you pick up the character you’re wearing. Certain character choices even seem to get magnified. But do something that isn’t in that character’s personality and the mask doesn’t work for you as well. It’s kinda like a more controlled version of what happened with the Jim Carrey character in The Mask. So with my finished mask, I began to explore how I would walk, look around, interact with others. Just a bit of physical movement seems to make the mask’s persona come alive. I tried that in the store for a while and the kids there were totally glued to what I was doing, maybe even a bit scared. They hadn’t expected to see some guy in a class turn into a strange character. But that’s the magic of it. And that’s the power that gets harnessed in Carnevale or with Goldoni’s actors. So when you create your own mask, you are recreating that mystery but with a totally new character. 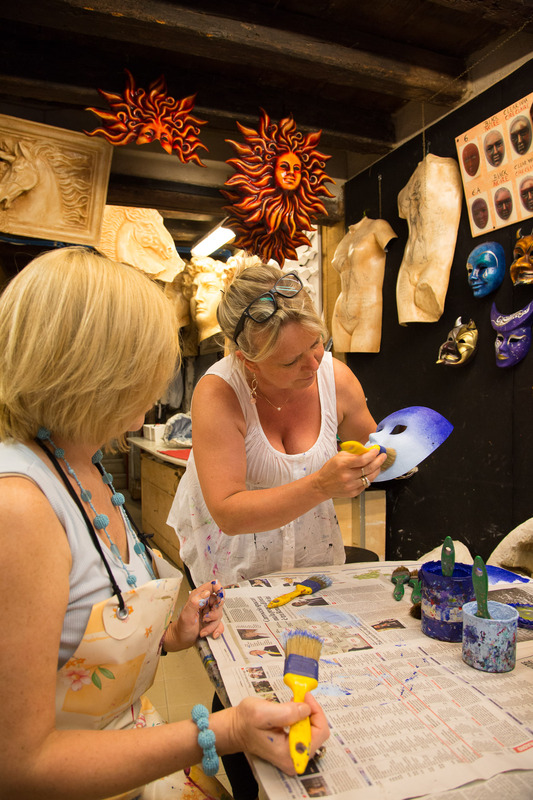 There’s lot of possibilities in a mask making class.